The fashion industry is worth 2.5 billion dollars and employs over 75 million people around the world, mainly female. It is a key economic sector which, given its scale, assumes an essential role in the achievement of the UN’s Sustainable Development Goals from their 2030 Agenda. The current situation is alarming though: this sector is causing a social and environmental emergency (almost 20% of water pollution is due to the fashion industry). A feasible way of facing up to this problem would be changing our consumption models, shifting them towards sustainable behaviours and attitudes. In the perspective of generating social awareness on the issue, on 7th February Cittadellarte’s Art and Fashion Offices and Officina +39 started the project “Trashformation”, inspired by the common experiences of these organizations, and with a programme including sustainable and innovative recycling practices only. The operation took off with the involvement of international fashion designers, artists and representatives of companies from the sector, who will work to recreate the life cycle of clothes using the latest textile technologies available on the market (particularly focusing on recycling), in order to demonstrate that sustainable clothing can be produced well before the ‘fateful’ 2030. How can we reduce waste combining the assonant ethics and aesthetics? “Trashformation” wants to interweave innovation and creativity with the virtuous practices of reuse and recycling. It is a ‘call to action’ which does not only focus on the environmental issues linked to the fashion industry, but looks at the whole ecosystem of our planet (the fashion industry is in fact inextricably connected to natural resources and human health). The project is also part of Cittadellarte’s strategical commitment in support of the UN’s Sustainable Development Goals from their 2030 Agenda, in specific reference to goals no. 12 (responsible consumption and production) and no. 6 (clean water and sanitation). The endeavour is in fact to scale down the production of waste through a process of prevention, reduction, recycling and reuse. 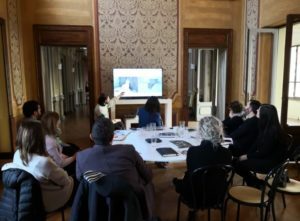 Implementing this project, Fondazione Pistoletto continues its strive to create a structured course of action leading to sustainable practices in the supply chain of the fashion industry. 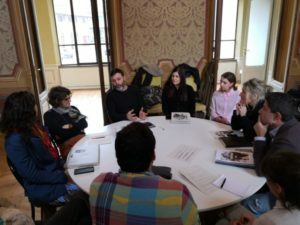 Due immagini dell’incontro di giovedì 7 febbraio a Cittadellarte. Cittadellarte has selected two fashion designers and three artists who will curate the project. They are Silvia Giovanardi and Matteo Ward (from the brand WRÅD, Italy), and Juan Manuel Gomez (Colombia), Laura Harrington (United Kingdom) and Emanuele Marullo (Italy). As mentioned, behind the scenes are Cittadellarte’s Art and Fashion Offices, alongside Officina+39, an Italian chemical company which has developed a patented range of sustainable and revolutionary dyes made from recycled clothes and textile waste (Recycromtm). Through their work, the artists and fashion designers will devise a cycle to realize clothes as sustainable as possible: they will delineate a productive process starting from recycled fibres and (sustainable) textiles, moving to the weaving and finishing of the items of clothing (employing innovative dyes), to accessories, to technologically advanced production machinery and systems. Each phase of the cycle will involve – and positively contaminate – one or more partners in the project (actors from the fashion sector operating in sustainability), as artists and designers will use their own tools and technologies. The works will then be presented in the course of a dedicated event held in Italy. “Trashformation – we read in the presentation of the project – wants above all to be an educational instrument to demonstrate that a better future is possible… now! This is why after its opening event in Italy the project will travel around the world for a year, stopping at the most important fairs of the sector (and not only)”. The first meeting about the project was held on Thursday 7th February in the spaces of Fondazione Pistoletto, attended by the artists and fashion designers, Cittadellarte’s staff, Officina+39 and a few partners in the project, whose companies will be visited in March by the participants working at the initiative; a speech involving experts on sustainability will also be organized (this event will be essential to share and gather information and as a source of inspiration for all the subjects taking part in the project). The next step will be in April: artists and designers will finalise the concepts of their works, while the partner companies will supply the materials. May will be the time of the actual production of the works (taking place in Cittadellarte in the course of 2/3 weeks) and the event presenting them to the public. Influential guests from the world of textiles will be invited to the presentation and the subsequent performance, the project installation will then be on display at Fondazione Pistoletto for a month. The project’s ‘tour’ is scheduled to start in July, which will promote it all over the world, also through educational initiatives on the topic and events organized by the partners. In the second half of 2019 Cittadellarte’s fashion project B.E.S.T. will include the experience of “Trashformation” in its didactic programme through dedicated workshops.